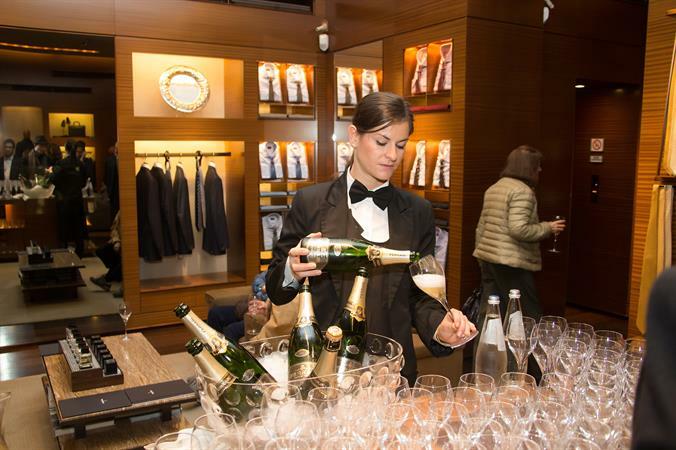 Throughout the evening of 8 October, the guests of the Zegna boutique were invited to explore the shared values of the two brands that have brought both of them great success, such as tradition, excellence and Italian heritage; each one being presented with a different label of Trentodoc sparkling wine. Tradition was represented by Ferrari Riserva Lunelli 2006; the only Ferrari in which the first fermentation takes place in large barrels of Austrian oak in honor of the progenitor, Bruno Lunelli. Excellence was represented by Ferrari Perlé 2008, recently named the “Best Italian Sparkling Wine” by the Champagne and Sparkling Wine World Championships. Finally, Italian heritage was embodied by Ferrari Brut Orgoglio Italia, the Trentodoc wine dedicated to Expo Milano 2015 and chosen by the Italian pavilion to toast all official occasions. In accordance with the essence of the Italian lifestyle the Ferrari starred chef, Alfio Ghezzi, proposed some sample dishes designed to enhance the three Trentodoc wines. A new occasion to celebrate the historic bonds that bind Zegna and Ferrari Winery, both expressions of the best of the Made in Italy. Apply for our newsletter and be the first to find out what’s new in the world of Ferrari’s exclusive sparkling wines.